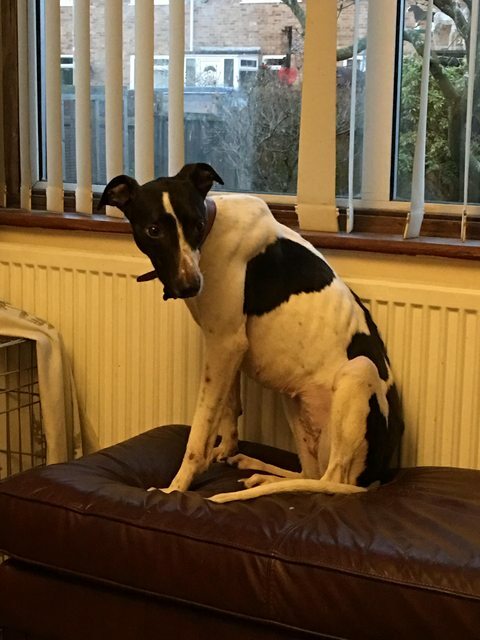 Elsa is a 2 year old liver and white Lurcher neutered female. Elsa came in to us in an awful state and has clearly had an awful start in life. Elsa came in to the rescue after she was seen being kicked out of a car. When she arrived she was full of wounds, emaciated and terrified. We are now three weeks on, she has gained 8kg and is really coming out of her shell. Elsa is a terrible food thief (this is very common in Lurchers) However she is very happy in her crate, so when we are cooking or eating we will pop her in her crate, as if you turn your back for a second she will have it! Elsa does pull moderately on the lead, however with a figure of 8 lead she walks to heal, she has good recall off lead however being a sighthound, if she saw a bunny I think she would go deaf! Elsa is not good with cats or small animals. Elsa is great meeting other dogs on and off the lead, her only negative is when she gets really excited playing, she starts to bark in the other dogs face (she just wants them to come and play more) but because they don’t know her they are not sure. We are doing some training work with this and she is getting better everyday, the trouble with Elsa is she is very vocal when she is excited and she just doesn’t understand why dogs get funny about it! 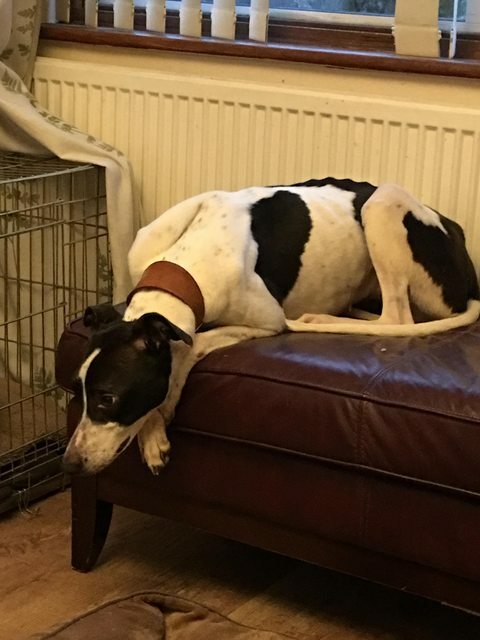 Elsa is good to be left for up to 4 hours (in her crate) and she sleeps downstairs at night, she is good with children 8+, when you come home she will get so excited she will woo woo away, she does try and jump up for a cuddle, so you would have to be careful that small children do not get taken out. We are training her out of the jumping up, however this is something that the new owner will continue. Elsa is fully vaccinated, micro chipped, neutered, up to date with all flea treatment and wormer and comes with 5 weeks free insurance.